Discover the eight Show Gardens, five Fresh Gardens, nine Artisan Gardens and more than 100 floral displays, which made up the 2017 RHS Chelsea Flower Show, sponsored by M&G Investments. 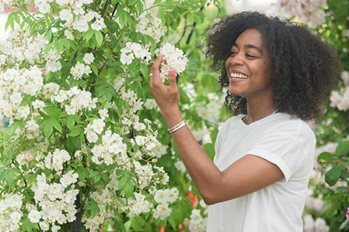 "As with every RHS Chelsea Flower Show for more than a century, designers, nurseryman and leading lights pulled out all the stops to make this the best gardening event in the world." Professor Nigel Dunnett designed the 2017 RHS Greening Grey Britain Garden. Set within the urban context of high-rise and apartment developments, Nigel demonstrated and celebrated the multiple benefits of plants and gardens in even the smallest of areas. He also provided a vision for the future development and use of private, communal and social spaces in the places where we live. Artisan Garden highlights included the 2016 winner of Best Fresh Garden, Gary Breeze, who designed a garden which features the replica of an 800 year old boat which was discovered in the Norfolk Broads. Meanwhile, Ishihara Kazuyuki returned for his 12th year with Gosho No Niwa inspired by the Kyoto emperors of Japan, and the work of Spanish architect Antoni Gaudí was the focus of Sarah Eberle’s Viking Cruises Garden of Inspiration. Fresh Garden highlights included Jack Dunckley’s The Bermuda Triangle which resembled an active volcano surrounded by tropical planting. At 23, Jack was one of the youngest garden designers ever to exhibit at the RHS Chelsea Flower Show. Kate Gould’s City Living demonstrated how to create a usable green space in an urban apartment block and Mind Trap by Ian Price, described his personal experience of depression. In the Show Garden category, James Basson re-created the stunning Maltese landscape for the M&G Garden: Melitense. Laurie Chetwood and Patrick Collins teamed up for the third time at RHS Chelsea with The Chengdu Silk Road Garden which combined architecture and planting in a conceptual East-West landscape with a dramatic ‘Silk Road’ bridge linking the different elements of the garden. Lee Bestall celebrated 500 Years of Covent Garden, while Andrew Wilson and Gavin McWilliam aimed to highlight endangered heathland for Wellington College with Breaking Ground. Chris Beardshaw meanwhile worked with the National Youth Orchestra on the Morgan Stanley Garden. The jewel in the RHS Chelsea crown, a 12,000sq metre marquee big enough to park 500 London buses, featured more than 100 exhibits from the world’s best nurseries, growers and florists. Also in the Great Pavilion, the Discovery Zone featured the Come to your Senses Eco Garden by Scotts Miracle-Gro aiming to tackle the overstimulated and sedentary lives of children in the UK, with a design that encouraged children to enter the haven of a garden. The British Ecological Society’s Delight in the Dark showcased the diversity of shade tolerant plants. Taking inspiration from the environmental issues surrounding bees, Burncoose Nurseries shone a light on the lesser-known plants pollinated by flies, moths and beetles, while Raymond Evison created a contemporary design inspired by the seashore. It featured sand, pebbles and five large waves running the length of the exhibit, each of which had a clematis arranged on and below them. Birmingham City Council brought the whimsical and wonderful world of Rowland Emett to life with a floral re-creation of ‘A Quiet Afternoon in the Cloud Cuckoo Valley’, the last-known machine made by the cartoonist and inventor in 1983. Sarah Eberle returned with Hillier Nurseries, assisted by 2016’s RHS Young Designer of the Year Caitlin McLaughlin. Just some of the anniversaries being celebrated in the Great Pavilion included the Hardy Plant Society, which featured 60 hardy plants for its 60 years, and Hooksgreen Herbs which celebrated 10 years exhibiting at RHS shows. Fibrex Nurseries created a tiered exhibit in tribute to the 30th anniversary of the National Plant Collection of Pelargonium, and Hardy’s Cottage Garden Plants returned to the world-famous flower show for its 25th year. Nurseries exhibiting for the first time included Hare Spring Cottage Plants with their collection of Camassia, Calamazag Nurseries and the Delphinium Society.